Uranium may be an interesting investment because the demand of electricity is going to increase in the next years and the world still bets on nuclear power. There is a nice balance between the production of uranium and its use right now, but a sharp increase in the number of nuclear plants must lead to higher prices for this commodity. Nuclear power capacity worldwide is increasing steadily, with over 60 reactors under construction in 15 countries (mainly in Asia and Russia), several plants increasing their capacity and others implementing life extension programs. The WNA 2015 Nuclear Fuel Report reference scenario (post Fukushima accident) shows a 26% increase in uranium demand over 2015-25. Demand thereafter will depend on new plant being built market. However, with electricity demand by 2040 expected (by the OECD's International Energy Agency in its World Energy Outlook 2015 report) to increase 70% from that of 2013, there is plenty of scope for growth in nuclear capacity. Right now it is felt a nice equilibrium between the supply and demand sides with 90% of production coming from mines and the rest from recycling weapons. 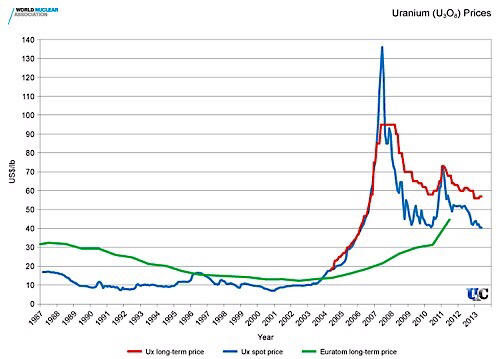 In any case, it is very common to use long-term contracts for uranium and, as we see on the chart, there is a premium of around 10 USD/lb between the spot price and the long-term price. Some countries such as Russia and China have bypassed the market buying directly Canadian and African mines to avoid any shortage of uranium in the future.